Cork flooring is one of the most beautiful and comfortable floor material options available. I used cork floors in my new house in the Kitchen and Den and can attest to the comfort and beauty of these floors (see above photo). Cork flooring is environmentally friendly and cork is considered a renewable and sustainable natural resource. These floors can be a little expensive and their installed cost per square foot can be close to a good quality ceramic tile floor. However, they are definitely worth the cost when used in smaller areas such as a Kitchen, Den or Dining Room but can be used in just about any flooring application. This tutorial will explain all about this wonderful floor and its benefits, the material of cork, how the floors are constructed and assembled and where you can find other resources on cork flooring. The Whistler Tree (World's Oldest Cork Tree). Before you can fully appreciate this floor material you really need to understand what this material cork is and what makes it special. Cork is harvested from the bark of the cork oak tree found in the Mediterranean. Cork comes from seven countries including Portugal, Spain, Algeria, Tunisia, Italy, Morocco, and France. Of these countries, Portugal is by far the largest producer of cork with over 30% of the world's cork trees and 70% of the world's cork production. The Whistler Tree shown in the above photo (which got its name from the birds who nested in it) is the world's oldest currently producing cork oak tree and was planted in 1783 in the Alentejo region of Portugal near the town of Åguas de Moura. Cork trees are harvested by hand every nine years and this one yielded one ton of raw cork in 1991, enough for over 100,000 wine bottle corks versus the typical yield of 4,000 corks. Cork bark is made up of a tiny sealed honeycomb cellular structure (14-sided polyhedrons) containing gas of 90% air. These cells provide resiliency (cushion) and insulation and there are about 40 million of these cells per cubic centimeter. Cork can be compressed up to 40% and quickly returns to its original shape. This all works to make cork a very special flooring material. Cork Floors are Healthy and Safe. The air trapped inside the cellular structure of cork provides a natural shock absorbing feel to the floor. It's great for applications where you are standing a lot such as in a Kitchen providing relief for your feet, back, and legs. Cork has a natural beauty rivaled by few other natural materials. It comes in many colors and different manufacturers provide various tile shapes and patterns as well. The same cellular structure that makes the floor comfortable also reduces noise and vibration. Unlike hard materials like tile, wood or vinyl, cork is quiet and reduces impact noise such as something dropping on the floor or the sound of walking by people or pets. Cork has natural properties that are anti-allergenic and resistant to insects. A naturally occurring waxy substance in cork called suberin repels insects, mites, and mold and protects cork from rotting when wet for a long time. In addition, suberin is naturally fire resistant and cork doesn't release any toxic off-gassing when it burns. These natural properties plus the coatings used to seal cork flooring make it healthy and safe for adults, pets, and baby. Durability is a strong trait of cork and cork floors have been used in public buildings such as churches and libraries since 1898, long before residential applications. Sometimes it's hard to see from photos just how rich a texture and pattern a cork floor has, so I'm providing this detail photo for you. The quarter is shown to provide a sense of scale. Cork now comes in a variety of colors, patterns, and textures. But as you can see, the depth and richness that cork can have is very special. Some companies mix rubber with cork to provide a special texture, some others are known for very vibrant colors. Some patterns resemble plank boards. Whatever your tastes, you're sure to find some pattern and color that's right for you. Cork flooring often comes in panels, although some manufacturers provide it in tiles too. In the case of a floating floor installation, the panel looks like the photo above and is approximately 12" wide by 36" long. The edges have specially fabricated grooves, similar to a tongue and groove, but are designed to interlock firmly in place. This is explained in more detail in the next section. 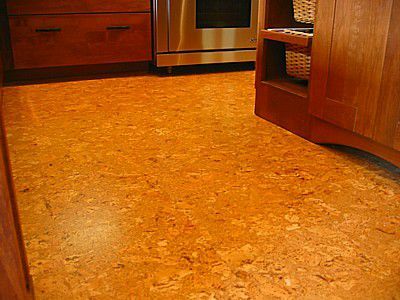 Cork floors come either in glue-down or floating floor applications. Glue-down installation results in lower material cost but much higher installation costs. It is also more difficult to repair a tile as opposed to a floating floor installation. Also, glue-down floors can only be applied over a smooth clean substrate so that precludes renovation applications over a vinyl tile floor for example. Floating floor installations are more common and are a preferred method of installation. As the photo above shows, the cork planks come with a specially designed edge that interlocks with the adjacent panels. Some manufacturers' floating floor products can be installed over most hard surfaces such as vinyl floor coverings, wood flooring, and ceramic tile, but soft subfloors like carpets must be removed. The subfloor will have to be even, flat, dry and level to within 0.1" in 6 feet. And of course, the substrate surface over which the floor will be installed will have to be completely dry. Floating Floor (glueless application). Although the actual construction of cork floors will vary slightly between manufacturers, it will generally consist of the following components. This is flexible low-density cork material used to provide acoustic insulation. It may be applied separately but is usually mad an integral part of a floating floor panel. This is the structure of the floor panel and is made from either HDF (High-Density Fiberboard) or MDF (Medium Density Fiberboard). The edges of the core will be milled in such a way as to allow the interlocking of the panel to adjoining pieces. The inclusion of this component varies by manufacturer but its intent is to provide additional insulation and impact absorption comfort for walking and standing. This layer is what you see. It can be the veneer from the cork tree bark some processed cork to get a particular pattern or texture. This can either be factory applied or field applied and will usually be a UV hardened varnish, oil or other sealer. Cork Floors Require Only Light Maintenance. With all the other benefits of cork flooring, would you expect anything less than low maintenance for these floors? Vacuum or sweep or "swiffer" the floor weekly. Damp mop the floor monthly but do NOT use a lot of water. When cleaning the floor, use a damp mop with a PH-balanced detergent or mild soap to clean and keep the surface free of abrasives such as grit or sand. Always avoid the use of harsh cleaners such as abrasives, oil or ammonia-based cleaning products. Only use cleaning products approved by the manufacturer. Bamboo Vs. Cork Flooring: Which "Green" Option Is for You?